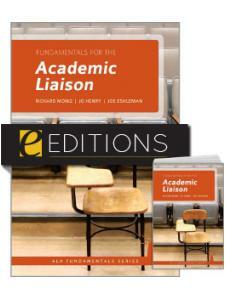 Written in a straightforward way that lends itself to easy application, Fundamentals for the Academic Liaison provides ready guidance for current and future academic library liaisons. 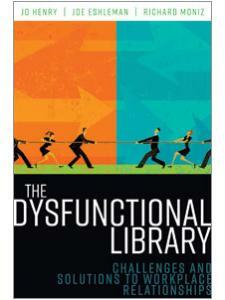 Richard Moniz, EdD, is Head Librarian at Horry Georgetown Technical College. He served as Director of Library Services for Johnson & Wales University's Miami campus from 1997–2004 and was the Director of Library Services at Johnson & Wales University's Charlotte campus from 2004-2018. He has also, in the past, simultaneously served as Head of Information Technology Services for Johnson & Wales in Miami and taught classes on subjects such as computer science, world history, US history, and American government. Additionally, since 2006, he has taught for the MLIS program at the University of North Carolina at Greensboro. Courses taught have included Information Sources and Services, Special Libraries, Library Administration, Information Sources in the Professions, and Online Bibliographic Information Retrieval. Dr. Moniz has published in numerous places. He is sole author of the 2010 textbook Practical and Effective Management of Libraries, coauthor of Fundamentals for the Academic Liaison, and coauthor and coeditor of The Personal Librarian: Enhancing the Student Experience. He is actively engaged in the profession and has held a number of committee and board responsibilities within the ALA, LLAMA (Library Leadership and Management Association), ACRL, CLS (College Libraries), and Metrolina Library Association (including serving as President of this organization) in addition to other nonprofit organizations such as Carolina Raptor Center, Charlotte Museum of History, and Charlotte's Arts and Science Council. Jo Henry serves as a librarian with the Charlotte Mecklenburg Library. Previously, she was the information services librarian at South Piedmont Community College. She obtained a Master of Library and Information Studies from the University of North Carolina Greensboro and a Master of Public Administration from Georgia Southern University. She has published in Public Services Quarterly, Library Review, Community and Junior College Libraries, and College and Research Library News, and has presented at the Metrolina Information Literacy Conference, North Carolina Library Association Conference, and the ALA Annual Conference. She currently serves on the Metrolina Library Association board. She is coauthor of The Mindful Librarian: Connecting the Practice of Mindfulness to Librarianship (2016), Fundamentals for the Academic Liaison (2014), and The Personal Librarian: Enhancing the Student Experience (2014). Joe Eshleman received his Master of Library and Information Science degree from the University of North Carolina at Greensboro in 2007. He has been the Instruction Librarian at Johnson & Wales University Library–Charlotte since 2008. During this time, he has taught numerous library instruction sessions. Mr. Eshleman completed the Association of College and Research Libraries' Immersion Program, an intensive program of training and education for instruction librarians, in 2009. He is a coauthor of Fundamentals for the Academic Liaison (alongside Richard Moniz and Jo Henry) and a contributor to The Personal Librarian: Enhancing the Student Experience. He has presented on numerous occasions, including at the American Library Association Conference, the Lilly Conference on College and University Teaching, the Teaching Professor Technology Conference, and the First National Personal Librarian and First Year Experience Library Conference. 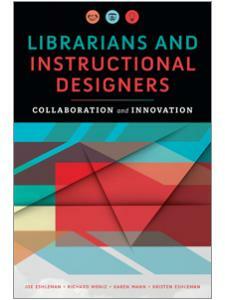 "It is easy to see this book becoming required reading for librarians pursuing a career in academia. However, many librarians struggle with how to be a better liaison regardless of how long they have been in the profession. This book is chock full of ideas, advice, and reasonable goals to set for oneself. 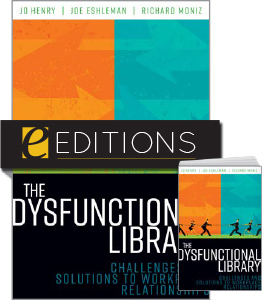 This would be an excellent book to share in chapters at continuing education or brainstorming events with colleagues to discuss how to enhance or expand liaison service." 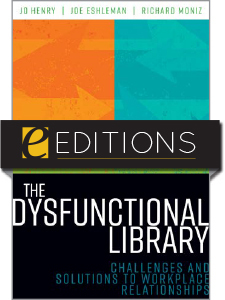 "If the authors' recommendations are followed, the reader will come away with all the tools and knowledge needed to establish a successful library liaison program … the authors have written a work that will become indispensable to new and experienced liaison librarians alike." 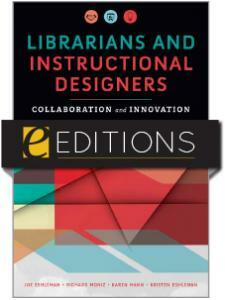 "A valuable reference especially for librarians new to liaison work." 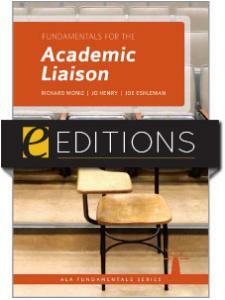 "Moniz, Henry, and Eshleman provide a thorough strategy for transporting the library liaison of the past into the 21st century … Each chapter contains multiple checklists and a short conclusion, followed by a list of references. This title would be an excellent starting point for any new librarian, and I can definitely envision it being used as a library school textbook. 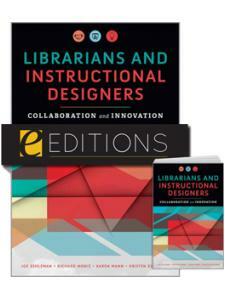 In addition, this title could be a valuable read for seasoned librarians who want to transform their current library liaison program."